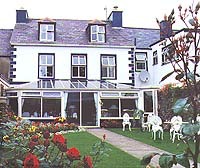 Situated in Dingle town centre, The Captain's House has a long tradition of hospitality and seafaring men. The Captain's House has been a Bed & Breakfast since 1886, when Captain Tom Williams, after meritorious service in the Royal Navy and Irish Lights, started taking lodgers. The Bed & Breakfast, served by the Kitchen Garden, earned a reputation for homely-ness, comfort and good food, which has lived on through various owners. In the late 1980s the seafaring tradition was renewed when the property was bought by Jim and Mary Milhench, Jim a retired Sea Captain, and Mary, a local girl brought up in the Bed & Breakfast tradition. Approached by footbridge over the Mall river through award-winning gardens, the Bed & Breakfast has been renovated and furnished with antiques and items collected on the Captain's voyages, creating an atmosphere of peace and tranquility. Whether relaxing with a book, having tea and cake in your suite, or barbequing on your deck, you will feel at home. Fine furniture and paintings, turf fires and fresh flowers create a warm, friendly and relaxing atmosphere which sets the mood for our bedrooms. With orthopaedic beds, satellite TV, and other home comforts, they are warm and cozy. En-suite bathrooms with loads of hot water complete the pleasure. Dingle provides a hub to explore the Dingle Peninsula and the Blasket Islands, Killarney and the Ring of Kerry, and Tralee and North Kerry. Water sports, golf, horse riding, cycling, and walking are close to hand. At the end of your outdoor day you are located in the centre of Dingle Town, only minutes from all its wonderful restaurants and pubs. The Captain's House is open throughout the year apart from a week in December. If you are planning a longer stay on the Dingle Peninsula, please consider our beautiful self-catering bungalow, " Bun An Tsrutháin", located on the seaside, just a few miles outside of the town of Dingle. We enjoy meeting and chatting with our guests, many of whom return year after year. This year, we look forward to meeting you! The Captain's House is recommended by John and Sally McKenna's 100 Best Places to Stay in Ireland, Rick Steves's Ireland, and Georgina Campell's Ireland's Best Places to Eat, Drink and Stay . please contact us by e-mail, telephone or fax. for rent year-round. Please read about our beautiful bungalow, "Bun An Tsrutháin", for more information on this accommodation.